Image Size: 24 X 40 in. The dream state is one of mystery. Dreams are the inner expressions of thoughts, feelings, and events that become vivid and alive while we enter into the limitless world of sleep. In Asencio’s dream world, color transcends to passion. 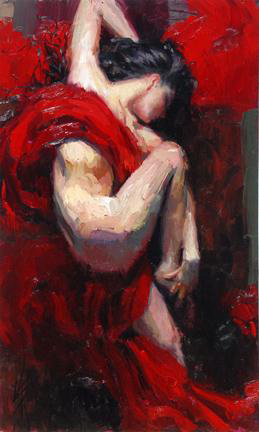 As his muse sleeps in a juxtaposition of scarlet draped over her alabaster skin, the artist’s choice of frantic hues serves to reflect a secret, burning desire. Is her state one of peace, or one of battle? Henry Asencio’s artistic talent lies within the power of his own subconscious translation. Passionate Dreams is a compelling composition that merges the mystery and seduction of complex abstraction with sensual figurative imagery: the struggle to find rest amidst a world filled with unrest. The passion within the struggle reveals answers found in the dreams that we pursue.